There are two genres that have made out particularly well on the Nintendo DS: puzzle games, and text-heavy adventure games. Ghost Trick: Phantom Detective combines a little of column A with a little of column B - it could best be described as a supernatural murder-mystery with logic puzzles. You see, in Ghost Trick, you're a newly-made ghost, and you have to figure out who you were and why you died. Most of the people who can help you answer these questions are a bit death-prone themselves, though, so it's lucky for you that you can use your ghostly powers to travel back in time to four minutes before a person died to try to avert their death and alter fate. Oh, and also, you can only talk to people if they are or have previously been dead, which often leads to situations in which the ghost of the dead person you're trying to save is looking over your shoulder and cheering you on. If any of the above piques your interest (and, honestly, how could it not? ), Ghost Trick may be up your alley. Anyway, your name is Sissel, and you're a ghost. You begin the game staring at the scene of your murder, but unfortunately, you have no idea how it happened or why. The game packages the good ol' amnesiac hero trope well - everyone who dies suffers from temporary memory loss, so for once it makes sense that your character needs the entire world explained to him as though he were six years old. Just because you're a ghost who can time travel doesn't mean that you're omnipotent - Sissel's powers are limited in that he can only possess and manipulate inanimate objects, and that he can only jump from object to object if they're pretty close together. Your first step in most puzzles is to figure out how to get Sissel from where he is to where he needs to be. The next step is to figure out what objects you can manipulate and when to manipulate them - flipping on a light or making a guitar play itself may alter fate one minute but make no difference the next. Strategy and attention to detail are important - even a split second can often mean the difference between saving a person and not saving them. This makes for some fabulous "Eureka!" moments, but unfortunately it also leads to a fair bit of trial-and-error guessing that may frustrate more casual players. Also occasionally frustrating is the game's extremely linear nature. Some puzzle games offer (or, at least, seem to offer) a few different paths to your objective, allowing for some variety in player behavior and increasing the games' replay value. Not so Ghost Trick; every puzzle has one solution, and once you've beaten the game you won't get much pleasure out of solving its puzzles again unless you've let it sit long enough to forget how to do everything. The game was created by Shu Takumi, who's also responsible for the Ace Attorney series, and Ghost Trick shares a fair bit of DNA with those games. 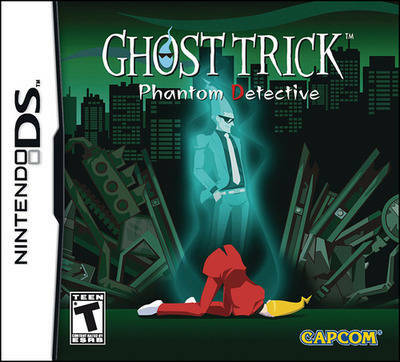 Both feature goofy, over-the-top characters with memorable quirks (one detective loves to dance; there's a chef who never stops singing), and both are sharply written and very well translated - the script for Ghost Trick can be genuinely funny, endearing, and sad in equal measure, which isn't always the case in video games (see: every game in which you shoot from a first-person perspective). The graphics are big and colorful and a great fit for the DS, and the character animations are sort of mesmerizing in their smoothness. The DS is more than six years old and its graphics capabilities leave a lot to be desired, but developers who stick to stylized visuals painted with broad strokes can usually cover for at least a few of the platform's weaknesses. Another carryover from the Ace Attorney series is an above-average soundtrack that does its job capably. Most of the tracks fit or accentuate the scene in which they're used, while a few stand above the crowd and get stuck in your head. The downside is that you're going to hear most of this music quite a few times before the game is over, but most of it is inoffensive enough (and tracks switch often enough) to keep the player from going insane. There's a lot to recommend Ghost Trick. It has a unique gameplay hook and is competent-to-excellent on all fronts design-wise, but its linearity means you can really only play it once without compromising the experience a bit. Hopefully this doesn't deter you from picking it up - I really want Shu Takumi to keep making games, is all.